Adoro Te - Adoro Te - Catholic homeschooling support in and around Connecticut. ​Extracurricular activities for families who choose ​to educate their children​ primarily at home. This image of the Pelican was contributed by the Ayers family. It sits above the tabernacle of Our Lady of Perpetual Help in Rocky Mount, NC. We are families who provide an education for our children primarily in the home. We gather together to support each other through spiritual, educational, and social activities. There are a number of performance and enrichment activities which are open to the public each year. These will be posted on this page as dates and times become available. Please feel free to use the Contact form above if you have any questions regarding the public events. Adoro Te offers over 50 activities for Adoro Te Families which are held at various locations. You may see the list of activities by following the links in the top menu. 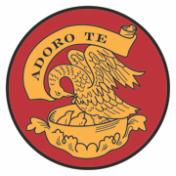 If you would like to become an Adoro Te Family, or if you have any questions please feel free to use the Contact Form found in the menu at the top of this page. This page was last updated 03.23.19 by DSM.